As the title of the show suggests, the key theme of this show is related to race. With a focus on his own religion, he gives insights about what it’s like growing up in Australia feeling like a cultural outsider. Drawing on well-known stereotypes, he milks the non-Muslim view of his religion for everything its worth and the many fans in the audience of his SBS TV show Legally Brown lap it up. When he gets into his groove, Hussain has great timing and never fails to deliver his punchlines with force. He was a little slow to get out of the blocks which could have hurt his chances of winning back the audience in a not-so-supportive room. However, once the momentum of the show gathered pace, he demonstrated the talent that’s afforded him so much success in the last few years. The performance I saw had an extra surprise at the end of the show. The timing couldn’t have been more perfect, during a moment when he was talking about being pursued by ASIO. Right on cue, a group of loud police vehicles drove past the Melbourne Town Hall drowning effectively him out. As he and the sirens paused, he came out with, “Does it…. mean they’re getting out when the sirens go off?” With that, he jumped off the stage and made a swift exit which brought the house down. It’s surprising to think that this is Hussain’s first solo festival show and scary to think of how good he will become as he makes his way to becoming a household name. If clever social commentary about race is your thing, then I recommend you check out Legally Brown. 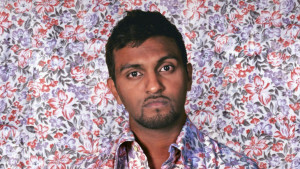 Nazeem Hussain – Legally Brown is on at Melbourne Town Hall until April 19th.